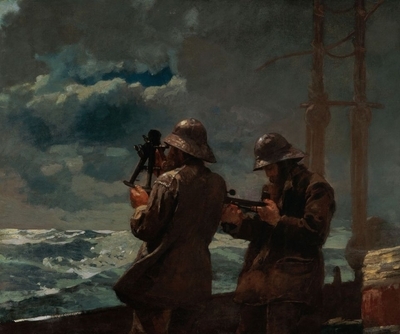 Little did the Bowdoin College Museum of Art know that an unsolicited phone call it received in 2014 would lead to an exhibition this summer that may change the way Winslow Homer is viewed in art history. On the line that day was Neal Paulsen, who lived about five miles from Prouts Neck, Maine—Homer's residence after he returned in 1884 from a two-year stay in Cullercoats, England. Paulsen, who said he had a camera once owned by Homer, met with skepticism. Frank H. Goodyear III, the co-director of the Bowdoin College Museum of Art in Brunswick, Maine, says that in a previous job as a photography curator, "I'd get calls like that from people who had unbelievable things, and 99% of the time what they had was less than interesting." But Paulsen's camera (at left)—which he later donated to Bowdoin—proved more than interesting, prompting a chain of research that resulted in the forthcoming exhibition, Winslow Homer and the Camera: Photography and the Art of Painting (23 June-28 October). Comprising 134 objects, including 19 paintings, 17 watercolours, about 50 photographs and archival materials, the exhibition will explore how what was then a new technology affected the way Homer made his art. Scholars have long written that Homer's art changed demonstrably after his time in England—his brushstrokes grew looser, his works more expressionistic, his palette darker, his subjects more philosophical. They also knew that Homer was aware of photography's influence on other artists. "It's a subject that many Homer scholars have been thinking about in recent years, and a fantastic subject for an exhibition," says Brandon Ruud of the Milwaukee Art Museum and the co-curator of Coming Away: Winslow Homer and England, which is on view at the museum until 20 May. "It took the catalyst of the gift of the camera to get someone to focus on it." "Eight Bells" shows a relationship with motion-study photos. But first Goodyear and his co-curator, the art history professor Dana Byrd, had to be convinced that Paulsen's camera really belonged to Homer. They found three solid clues. Carved into its wooden frame were the initials W.H. and the date 15 August 1882—which matches Homer's time in Cullercoats. 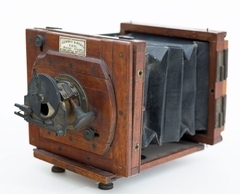 Also, the camera was made by Mawson & Swan, a photography business located less than 10 miles from the English village. Finally, Bowdoin's archive of materials on Homer included many photographs in the same 3in by 4in format as this camera, Goodyear says, adding that "enlargements didn't exist at the time". The pair have since assembled items that show how photography increasingly became part of Homer's "visual investigation and broader creative practice". In contrast to more realist artists, Homer found photography to be freeing—his work became not more precise but more, well, blurred. "I think Homer understood that vision through photographs was more complicated and more subjective than was thought" at the time, Goodyear says. It's now evident, he notes, that Homer, while known as a Realist, "was a proto-Modernist. He is less interested in a traditional academic rendering of the land—he's interested in 'things as they appear'". His anticipation of Modernism, Byrd adds, "is related to the very modern use of the image—multiple sources serve as the basis for a single image in the end". Homer acquired two additional cameras in the 1880s, and photography remained part of his artistic practice for the rest of his life. But, Goodyear says, "it's important to note that we're not celebrating his achievements as a photographer—his existing photographs are relatively modest and they do not compare to [those by his contemporary] Thomas Eakins. Homer saw himself as a painter, not in competition with photography, but something he had to reconcile with."